Borgo Egnazia Resort is one of the Mediterranean’s newest luxury hotels located in the beautiful and unspoilt region of Puglia in Southern Italy, built in the style of a traditional Apulian village. The Borgo Egnazia Resort was created using traditional craftsmanship blended sympathetically with the local architecture and history that typifies this undiscovered region of Italy. Offering a superb luxury collection of villas, townhouses ,hotel rooms and suites add to this the magnificent resort facilities with Kids Club, Golf, Tennis, Spa, Watersports , Restaurants & Bars and you have the perfect luxury family resort. This stunning luxury Italian resort is the perfect luxury honeymoon in Italy, golf lovers, sun worshipers as well as a luxury family holiday. Design Holidays is a preferred travel partner for this luxury resort in Puglia Italy and will never be beaten on price when it comes to luxury family resort holidays, please feel free to put us to the test. Give us a call to find out more about our Luxury Family Resort Offers. The hotel is located in Puglia Southern Italy, 5 minutes from local fishing village of Savelletri composed of 3 different areas; La Corte (hotel), Borgo village and Villas. The hotel has 63 elegant guest rooms that range from Superior rooms to enormous 1 and 2 bedroom suites, many of which are interconnecting. The resort has 30 villas (spread across 8 separate buildings) all have 3 bedrooms. They represent the most luxurious and exclusive accommodation at the resort. The impressive Borgo Egnazia resort also boasts a fantastic spa in the ‘La Corte’ building. Set over two floors and over an amazing two hundred square metres, the Vair Spa has received countless nominations for best Spa – globally – and even won the 2013 Tatler Spa Award for their facilities within the Borgo Egnazia surrounding. 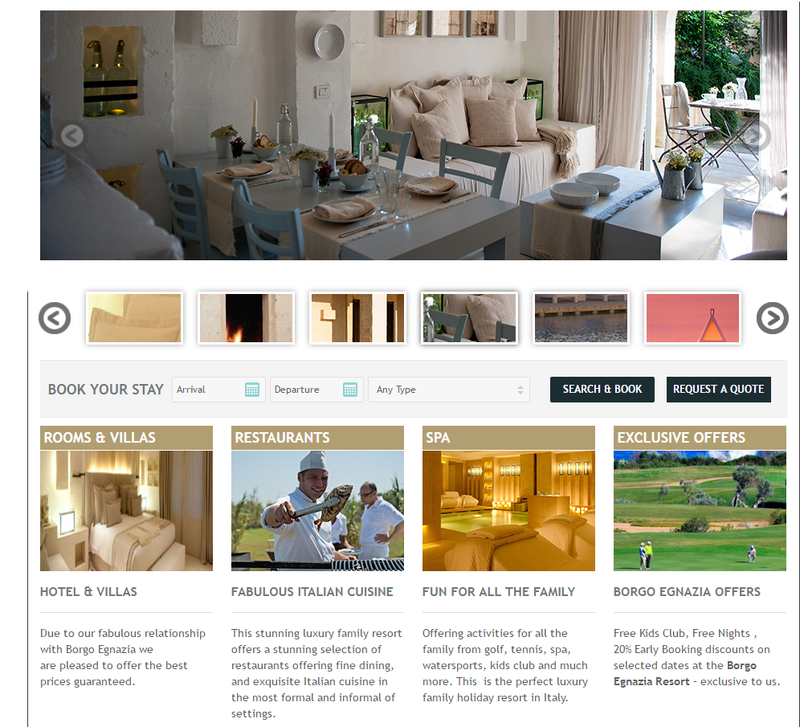 For discerning golf lovers, the Borgo Egnazia resort really holds some extra charm. With views to the Adriatic sea from all angles, the 18-hole course of San Domenico surrounds the resort. The fishing marina of Savelletri is to one side, whilst the ancient city of Egnathia resides on the other. The course is unique and uneasy to master, and was created by Jeremy Slessor of the European Golf Design of London. Meeting USGA guidelines, this is a course with expansive greens, and used fine Bermuda grass for the fairway. Truly memorable, if the keen golfer manages to avoid the festuca roughs, it is possible to see the necropolis ruins of the Egnathia’s ancient city from hole 8 onwards, along with a stunning, panoramic sea view. Your accommodation is located in a scenic seaside patch of Puglia, encircled by the San Domenico Course.